Purdue at 150: A Visual History of Student Life by David M. Hovde, Adriana Harmeyer, Neal Harmeyer, and Sammie L. Morris tells Purdue’s story through rare images, artifacts, and words. Authors culled decades of student papers, from scrapbooks, yearbooks, letters, and newspapers to historical photographs and memorabilia preserved in the Purdue University Libraries Virginia Kelly Karnes Archives and Special Collections. Many of the images and artifacts included have never been published, presenting a unique history of Purdue University from the student perspective. Purdue at 150 is organized by decade, presenting a scrapbook-like experience of viewing over 400 rare photographs, documents, and artifacts alongside critical contextual information. Each chapter provides a decadal historical sketch of Purdue University, offering insight into the institution’s unique culture while incorporating campus responses to major national events such as world wars and the Great Depression. Spotlight sections highlight Purdue firsts, including the first graduates of programs, the growth and development of the international student population at Purdue, the creation of significant student organizations, and the foundations of both old and new campus traditions. 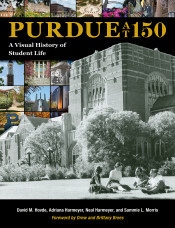 This curated journey through the personal experiences, spaces, and events of Purdue’s history not only celebrates major accomplishments and acknowledges the contributions Purdue has made to society, but it also explores some of the challenges and tragedies that shaped Indiana’s land-grant university. As a result, Purdue at 150 connects the identity and character of the University of 1869 to the University of 2019 and beyond, as told through the stories of its students. Running throughout this journey is the enduring vision of the land-grant institution and its impact on society, as seen through the material culture of Boilermakers from around the world. A preview of Purdue at 150 is available here. David M. Hovde, the research and instruction librarian in the Virginia Kelly Karnes Archives and Special Collections Research Center, is an associate professor of library science and has been at Purdue University since 1989. He has authored or coauthored numerous monographs, books, book chapters, and articles in archaeology, history, semiotics, and pedagogy. Adriana Harmeyer is outreach archivist in the Purdue University Libraries Virginia Kelly Karnes Archives and Special Collections Research Center, where she makes the history of Purdue University and its people available to researchers of all ages and interests, and ensures that it will be accessible to future generations. She is a graduate of Marshall University in her hometown of Huntington, West Virginia, and earned her master’s degree from the University of Michigan. She currently lives in West Lafayette with her husband, cats, and books. Neal Harmeyer is an archivist at Purdue University Archives and Special Collections. Harmeyer grew up on a multigenerational family farm in northeastern Fayette County, Indiana, where he helped raise animals. He earned a BA degree in history from Purdue and an MLS degree from Indiana University.